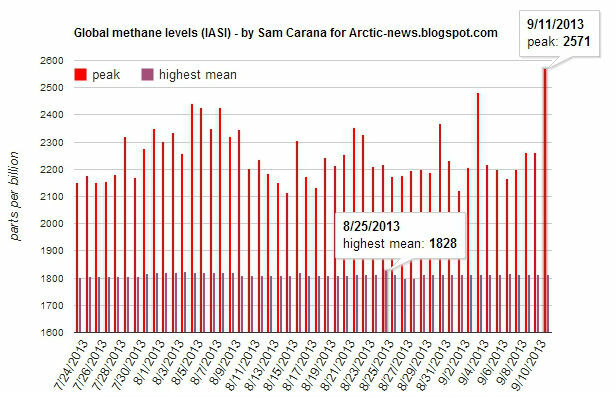 Methane as recorded by IASI* reached levels of up to 2571 parts per billion (ppb) on September 11, 2013. 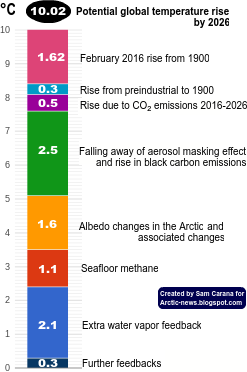 The image below shows the peak levels that have been reached recently, as well as the highest mean methane level for each day. 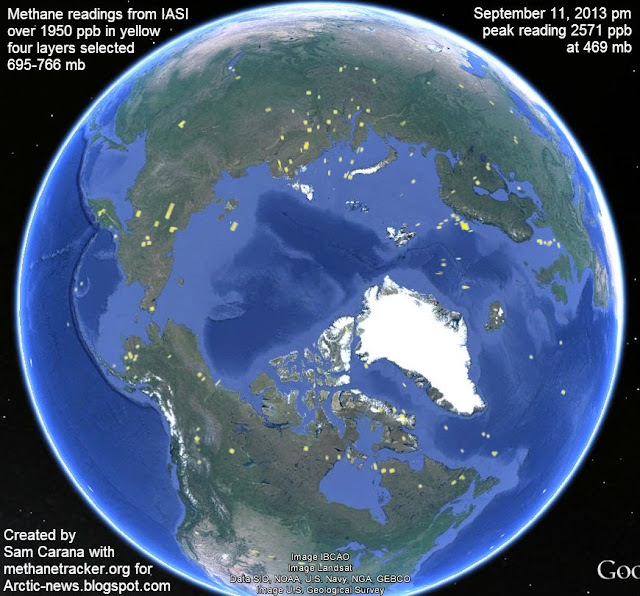 Where did the methane come from? IASI data do not identify locations, other than that all locations where methane is present in concentrations higher than 1950 ppb show up in yellow. Yet, there are some ways to further examine where these high levels came from. To create the top image, only four layers were selected. The yellow spots on the image show locations where methane is present at the selected layers (695-766 mb) at concentrations of 1950 ppb and higher. At these relatively low altitudes, yellow spots will show up at fewer locations than at some of the higher altitudes, yet one can assume that the largest sources will be included among those showing up; and indeed, peak methane levels at these altitudes ranged from 2193 ppb to 2328 ppb, which are extremely high levels. On the top image, there are several locations that look suspicious, including a large spot north of the New Siberian Islands, while the Kara Sea and the Barents Sea, and many locations around Greenland all feature suspicious yellow spots. Most worrying are the numerous spots clustered off the coast of Norway, which show up quite prominently at many altitudes. The situation is reminiscent of the Storegga Slides, the underwater landslides that occurred at the edge of Norway's continental shelf thousands of years ago. The latest incident occurred some 8,000 years ago. Earthquakes can cause tremors over long distances, especially along fault lines. 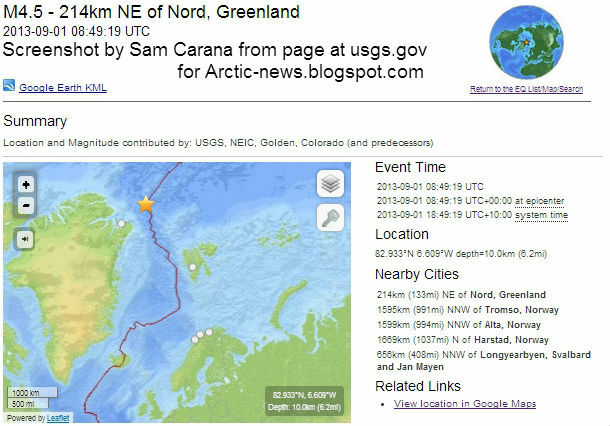 There has been some seismic activity close to Greenland that could have triggered one or more landslides off the cost of Norway, since the fault line points that way. 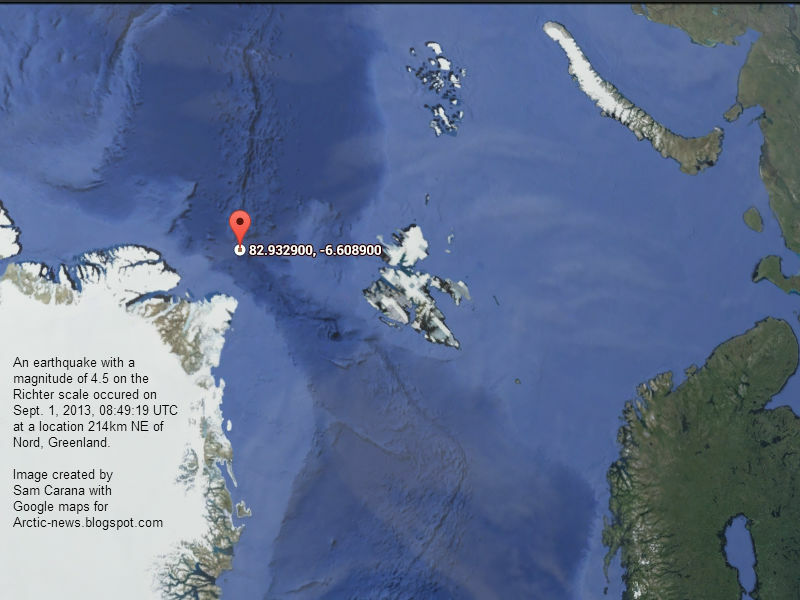 An earthquake with a magnitude of 4.5 on the Richter scale occurred occured on September 1, 2013, 08:49:19 UTC, at a location 214km NE of Nord, Greenland, as illustrated by above image and the image below. This I just posted at LibyanYouthMovement link to story of Benghazi inability to contain violence. http://www.shabablibya.org/news/libya-benghazi-on-the-brink It is after trying to make comment here on this article at Arctic News and going to feed of comments on Twitter I've been following since FEB17th 2011. Don't believe everything you read. There is a situation of Entropy rise worldwide and it isn't going to stop because acceleration of heat increase is on the rise and no Real counter or plan is in effect to stop it or to protect the least culpable. Physical capability of stopping rise of forces to extinct us aside, it is theoretically achievable to place near full force of human desire to live, effectively in front of force that wants to extinct life from Earth. That is Act of God alteration of world financial note so it counts real value. 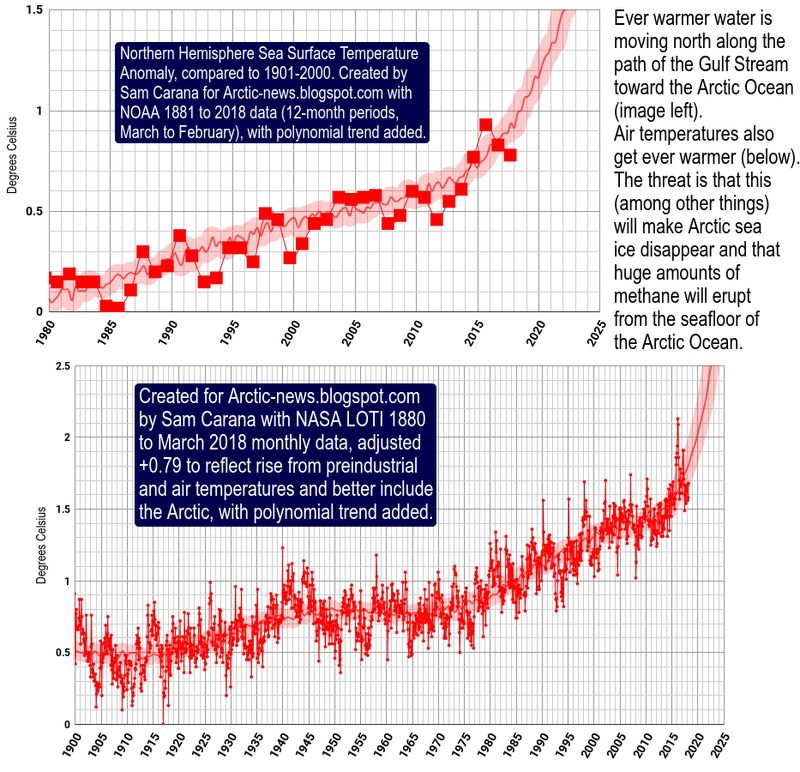 This is laid out most plainly at Arctic News Blog but I'm having a bit of trouble making comment there today. Plainly.. Because if I describe situation I'm confounded. -Perhaps everyone needs to not think so hard and speak plainly about things. Arms can not protect us- ideas can..
An idea has potential to zoom rate of change up - by affecting sentiment. I'm attempting to gain support for root core change to frame of monetary. Best described by trying to get economist professor interested in physics. //plus.google.com/+DemocracyNow/posts/RUWs7k9optD To link Earth to money..
That's Earth with open systems of Nature holding Earths' HZ about the Sun. Through thick and thin and till runaway heat does us part. Altering unit of trade to include value relative to restoring Earth so she stands fast. It's like I'm in the lobby of a college and even English department isn't interested in reading let alone hearing who and what obsesses and could restore balance so Earth lives. Maybe not so happily onward in bliss. But wouldn't it be cool to hope things get better and frame it so. So it naturally tends to go that way by its very nature.. naturally.